Rarely do sequels surpass or even come close to the original, in fact I can only think of a few instances of it happening: The Godfather Part II, The Dark Knight and Pulse 2 immediately come to mind (ok, scratch that last one). In 1999 Toy Story 2 did just that, taking on the original Toy Story and giving audiences an equally compelling and heartfelt story. The plot this time around involves Woody (TOM HANKS) being left behind from a cowboy camp Andy goes to every year after his arm gets torn. When he valiantly rescues Wheezy the Penguin from being placed in a yard sale, Woody is trapped outside and discovered by a money-hungry scoundrel named Al the Toy Collector (WAYNE KNIGHT). You see, Woody was a big star back in the 1950s alongside Jessie the Yodeling Cowgirl (JOAN CUSACK) and Stinky Pete the Prospector (KELSEY GRAMMER), as well as Bullseye, his trust steed. Together, the dolls are worth a bundle but only with Woody, otherwise the others must go back into a box and storage locker which Jessie has no desire to despite Woody’s protests and escape attempts. Meanwhile, Space Commander Buzz Lightyear (TIM ALLEN) leads an expedition including Mr. Potato Head (DON RICKLES), Slinky the Dog (the late JIM VARNEY), Rex the Green Dinosaur (WALLACE SHAWN) and Hamm the Piggy Bank (JOHN RATZENBERGER). They make their way through the big city finally finding Woody’s location but it appears he wants to stay so not to break up the “Woody’s Roundup” gang. The plot isn’t all too complicated and on the surface doesn’t seem like much, but the heart behind it makes it so great and probably far and away better than the original. The part I’ve always remembered from Toy Story 2 is Jessie’s heartbreaking story, a song describing her life with her owner from childhood to teenage years and beyond. I can say it did not make me cry as it may have done in the past, but it’s still had more emotion than so many live action features do. Beyond the plot, you once again have some picture-perfect voice casting. Obviously Tom Hanks and Tim Allen already have the animated friendship chemistry going full force and you also add in the other returning actors but the inclusion of Joan Cusack and Kelsey Grammer was nothing but brilliant as each brought a uniqueness to their roles. And of course, neither Cusack nor Grammer are exactly A-list actors and Pixar cast based upon their voices rather than star power. Personally, an animated picture will live or die based on the story and animation style, not whether Will Smith or Angelina Jolie are the lead voice actors. Overall, Toy Story 2 measures up and even exceeds the original which was already great to begin with. The story, by a collective group including Andrew Stanton and Pete Docter, actually is better developed than TS1 while the animation itself also seems smoother and more refined. Note: All the features that came with the 2-disc Blu-ray release are the same here. The 3D Blu-ray disc does not contain any features. The 3D Blu-ray comes housed in an HD Keep Case with a lenticular slip cover. Audio Commentary features Director John Lasseter, Co-Directors Lee Unkrich and Ash Brannon and Co-Writer Andrew Stanton. Like the track for TS1, the participants are, no pun intended, fairly animated describing where the ideas for the stories came from, new voice casting and other bits of movie-making trivia. Toy Story 2 Sneak Peek: “The Characters” (4:01; HD) covers all the characters and voice actors returning for this third installment plus the new toys making their debuts including Ken voiced by Michael Keaton. Buzz Lightyear Mission Logs: International Space Station (3:45; HD) is another featurette kids will enjoy learning about the space station and space suits narrated by Buzz, Rex and Hamm. It is kind of funny that they had a Buzz Lightyear toy in space with the astronauts. Paths to Pixar: Technical Artists (4:24; HD) – This featurette introduces us to a few of the other artists who work for Pixar as they explain where their love for their job came from. Next on this list we get another 3 Studio Stories to go along with the previous three that came with TS1. First up is “Toy Story 2 Sleep Deprivation Lab” (1:27; HD) followed by “Pinocchio” (2:16; HD) and lastly, “The Movie Vanished” (2:34; HD). These are crudely animated shorts with someone at Pixar narrated on what happened during the making of the movie. This is pretty funny and interesting way to present these stories. Pixar’s Zoetrope (2:00; HD) is a cool featurette seeing the zoetrope Pixar used to help them animated their movies. Celebrating Our Friend Joe Ranft (12:47; HD) is a nice featurette honoring Ranft, who was killed in a car accident in 2005, from his friends and co-workers. It’s a sad but bittersweet look at a guy who seemed genuinely nice hearing from those who knew him. Making Toy Story 2 (8:11; SD) – This is a fairly mundane making-of featurette though I always enjoy seeing the recording sessions with the cast, and this offers some snippets of Tim Allen and Tom Hanks working together. John Lasseter Profile (3:03: SD) takes a look at the Toy Story 1 & 2 director who has contributed so much to the Pixar studio. Members of the cast and crew offer up their praise for the man who basically built Pixar, someone even compared him to Walt Disney, something that isn’t exactly unfounded IMO. Cast of Characters (3:30; SD) goes through the characters in the Toy Story movies from Tom Hanks and Tim Allen (and the other returning actors) to the new characters voiced by Joan Allen and Kelsey Grammer. Next up are just two ordinary deleted scenes (4:11; SD): Godzilla Rex and Crossing the Road. This also includes an intro explaining why they were scrapped. In the Design (TRT 16:43; SD) subset we get some Galleries of Woody, Buzz, Andy’s Toys, Misc. Toys, Zurg, etc. but nothing really fascinating here, just a bunch of concepts for the various characters set against the movie’s score. There’s also several 3D Visualization sets from the characters to locations; and another set for Color. Under Production (TRT 13:41; SD) there is Designing Woody’s Past (2:50), Making Woody’s Roundup (2:00), a Production Tour (2:31), Early Animation Tests (3:03), Special Effects (1:38) and an International Scene (1:47) which was alluded to in the commentary. Each of these short featurettes is fairly informative and fills in the gaps not covered in other features. Music & Sound (TRT 14:08; SD) includes Designing Sound (5:39) takes a look at how the sound design was done (like the dog barking), Making the Songs (3:25) taking a look at how the songs were written including the two videos included, “Woody’s Roundup” Music Video (2:17) and “Jessie’s Song” Randy Newman Demo (2:50). With Publicity (TRT 8:32; SD) we, of course, get Character Interviews (2:05), Trailers (3:24), TV Spots (2:12), Posters (0:51) and Baseball Woody (0:19) which has Woody throwing out a pitch. I have no idea what this was used for, however. And lastly the set also has a BD-Live (** Blu-Ray Exclusive **) portal, a DVD Copy and some previews for other Disney titles including Toy Story 3. What’s missing from the “Ultimate Toy Box” (this goes for Toy Story 1 & 2)? Not a whole lot, actually, but the animated short – and inspiration for the movie – Tin Toy, Short Film Luxo Jr., a 5.1 Sound Effects-Only Track, Production Notes and I think Cast Notes. There might be a couple more, but I think that about does it. 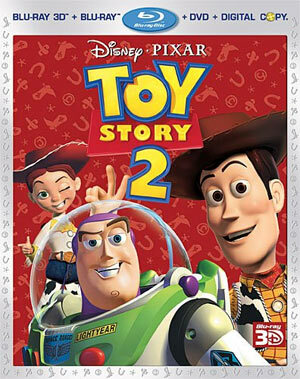 Toy Story 2 arrives in 3D on Blu-ray presented in 1.78:1 on a 50GB Disc. What was originally conceived as a direct to video film turned into a theatrical movie. Some may thing this would mean lower production values but you would never know here. Out of all three films, I think this one looks the best in 3D. No gimmicky things were inserted and everything just looks very natural. The 2D Blu-ray boasts some amazing Picture Quality with gorgeous colors and detailed characters, but the 3D ups that by giving them another dimension to shine in. While I’m not a fan of those conversion films, animated films tend to fare better than live action. Meanwhile, the 5.1 DTS-HD Master Audio track is nothing to sneeze at either. Everything from the dialogue to sound effects comes across each channel with amazing clarity. For instance, when the toys are crossing the street to get to Al’s Big Toy Barn, the traffic noise as cars and trucks collide with one another has great depth that you sometimes don’t even hear with live action films. Along with the more noticeable traits, we also get some of the more subtle elements such as echoes inside an elevator shaft. Okay, I’m willing to borrow a copy of the Blu-ray and watch this for the third time and perhaps the special features and home audio will win me over. I saw it in the theater first and then again on TV and I didn’t like it as much as the first 2 either time. The 3D version was so dark I couldn’t tell what was going on and I thought the laughs were less than the previous installments which is the most important part of the movie to me. I love how convenient it was to watch this movie the other day when I was out of town on a business trip. I hooked my laptop up to the TV in my hotel room and pulled up the movie on my dishonline.com employee account. It was free for me as a customer and I agree that I would recommend this movie; it was very funny.